This section contains long-range projections, in dollars, of the operations of the combined OASI and DI Trust Funds and in some cases the HI Trust Fund. Comparing current dollar values over long periods of time is difficult because of the effect of inflation. In order to compare dollar values in a meaningful way, table VI.G6 provides several economic series or indices which can be used to adjust current dollars for changes in prices, wages, or other aspects of economic growth during the projection period. Any series of values can be adjusted by dividing the value for each year by the corresponding index value for the year. One of the most common forms of standardization is price indexing, which uses some measure of change in the prices of consumer goods. The Consumer Price Index for Urban Wage Earners and Clerical Workers (CPI-W, hereafter referred to as CPI), published by the Bureau of Labor Statistics, Department of Labor, is one such price index. The Social Security Administration (SSA) uses this index to determine the annual cost-of-living increases for OASDI monthly benefits. The ultimate annual rate of increase in the CPI is assumed to be 3.2, 2.6, and 2.0 percent for the low-cost, intermediate, and high-cost sets of assumptions, respectively. Table VI.G7 provides CPI-indexed dollar values (those adjusted using the CPI in table VI.G6), which indicate the relative purchasing power of the values over time. Wage indexing is another type of standardization. It combines the effects of price inflation and real-wage growth. The wage index presented here is the national average wage index, as defined in section 209(k)(1) of the Social Security Act. SSA uses this index to annually adjust the contribution and benefit base and other earnings-related program amounts. The average wage is assumed to grow by an average rate of 5.0, 3.8, and 2.6 percent under the low-cost, intermediate, and high-cost assumptions, respectively, between 2026 and 2091. Wage-indexed values indicate the level of a series relative to the changing standard of living of workers over time. The taxable payroll index adjusts for the effects of changes in the number of workers and changes in the proportion of earnings that are taxable, as well as for the effects of price inflation and real-wage growth. The OASDI taxable payroll consists of all earnings subject to OASDI taxation, with an adjustment for the lower effective tax rate on multiple-employer excess wages. A series of values, divided by the taxable payroll, indicates the percentage of payroll that each value represents, and thus the extent to which the series of values increases or decreases as a percent of payroll over time. The GDP index adjusts for the growth in the aggregate amount of goods and services produced in the United States. Values adjusted by GDP (see section 2 of this appendix) indicate their relative share of the total output of the economy. No explicit assumption is made about growth in taxable payroll or GDP. These series reflect the basic demographic and economic assumptions, as discussed in sections V.A and V.B, respectively. Discounting at the rate of interest is another way of adjusting current dollars. The compound new-issue interest factor shown in table VI.G6 increases each year by the assumed annualized nominal yield for special public-debt obligations issuable to the trust funds in the 12 months of the prior year. The compound effective trust-fund interest factor shown in table VI.G6 uses the effective annual yield on all currently-held securities in the combined OASI and DI Trust Funds. The reciprocal of the compound effective trust-fund interest factor approximates the cumulative discount factor used to convert nominal dollar values to present values as of the start of the valuation period in order to create summarized values for this report. CPI-W indexed to calendar year 2017. For each alternative, incorporates the average of the assumed annual yield for special public-debt obligations issuable to the trust funds in the 12 months of the prior year. For each alternative, incorporates the annual effective yield for all outstanding special public-debt obligations held by the trust fund, with a half-year’s interest effect in each row. The effective yield for a period equals total interest earned during the period divided by the total exposure to interest on asset reserves and all income and outgo items during the period. The reciprocals of the factors approximate the discounting/accumulation factors that are used to calculate summarized rates and balances in this report. Table VI.G7 shows the operations of the combined OASI and DI Trust Funds in CPI-indexed 2017 dollars—that is, adjusted by the CPI indexing series as discussed above. The following items are presented in the table: (1) non-interest income, (2) interest income, (3) total income, (4) cost, and (5) asset reserves at the end of the year. Non-interest income consists of payroll tax contributions, income from taxation of benefits, and reimbursements from the General Fund of the Treasury, if any. Cost consists of scheduled benefits, administrative expenses, financial interchange with the Railroad Retirement program, and payments for vocational rehabilitation services for disabled beneficiaries. Table VI.G7 shows trust fund operations under the low-cost, intermediate, and high-cost sets of assumptions. CPI-indexed 2017 dollars equal current dollars adjusted by the CPI indexing series in table VI.G6. Benefit payments which were scheduled to be paid on January 3 for some past and future years were actually paid on December 31 as required by the statutory provision for early delivery of benefit payments when the normal payment delivery date is a Saturday, Sunday, or legal public holiday. For comparability with the values for historical years and the projections in this report, all trust fund operations and asset reserves reflect the 12 months of benefits scheduled for payment each year. The combined OASI and DI Trust Funds become depleted in 2034 under the intermediate assumptions and in 2029 under the high-cost assumptions, so estimates for later years are not shown. Figure VI.G1 compares annual cost with annual total income and annual non-interest income. The figure shows only the OASDI program under intermediate assumptions, and presents values in CPI-indexed 2017 dollars, consistent with table VI.G7. The difference between the income values for each year is equal to the trust fund interest earnings. 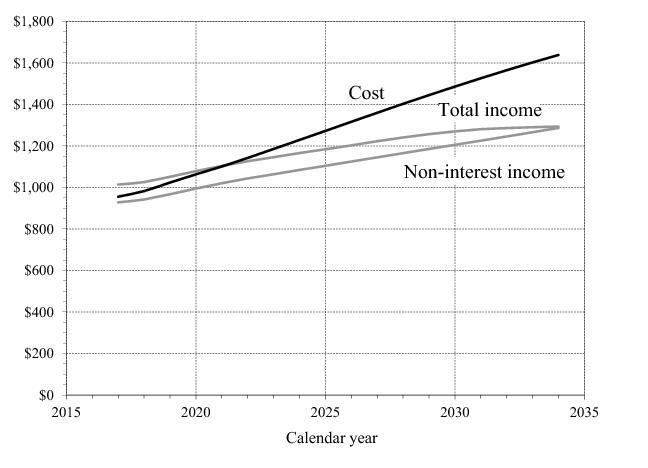 The figure illustrates that, under intermediate assumptions: (1) annual cost exceeds non-interest income in each year of the projection period; (2) total annual income, which includes interest earnings on trust fund asset reserves, is sufficient to cover annual cost for years 2017 through 2021; and (3) total annual income is not sufficient to cover annual cost for years beginning in 2022. For 2022 through 2033 (the year preceding the year of trust fund reserve depletion), annual cost is covered by drawing down combined trust fund reserves. Table VI.G8 shows the operations of the combined OASI and DI Trust Funds in current, or nominal, dollars —that is, in dollars unadjusted for inflation. The following items are presented in the table: (1) non-interest income, (2) interest income, (3) total income, (4) cost, and (5) asset reserves at the end of the year. The Trustees present these estimates using the low-cost, intermediate, and high-cost sets of demographic and economic assumptions to facilitate independent analysis. Table VI.G9 shows values in CPI-indexed 2017 dollars—that is, adjusted by the CPI indexing series discussed at the beginning of this section. This table contains the annual non-interest income and cost of the combined OASI and DI Trust Funds, of the HI Trust Fund, and of the combined OASI, DI, and HI Trust Funds, based on the low-cost, intermediate, and high-cost sets of assumptions. For OASDI, non-interest income consists of payroll tax contributions, proceeds from taxation of OASDI benefits, and reimbursements from the General Fund of the Treasury, if any. Cost consists of scheduled benefits, administrative expenses, financial interchange with the Railroad Retirement program, and payments for vocational rehabilitation services for disabled beneficiaries. For HI, non-interest income consists of payroll tax contributions (including contributions from railroad employment), up to an additional 0.9 percent tax on earned income for relatively high earners, proceeds from the taxation of OASDI benefits, premium revenues, monies from fraud and abuse control activities, and reimbursements from the General Fund of the Treasury, if any. Total cost consists of outlays (scheduled benefits and administrative expenses) for beneficiaries. The Trustees show income and cost estimates generally on a cash basis for the OASDI program1 and on an incurred basis for the HI program. Table VI.G9 also shows the balance, which equals the difference between non-interest income and cost.